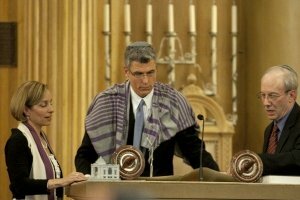 Rabbi Rick Jacobs was installed as president of the Union for Reform Judaism at Congregation Beth Elohim in Brooklyn, NY, June 9, 2012. The inaugural address he made ought to be the inspiration of most modern, particularly US, Christians, who betray constantly that they know nothing in the least about the teachings of the man whom they believe is God incarnate, Jesus Christ, and how he expected Christians to behave to be Christians. Here following are some slightly modified extracts from the speech with “Reform Judaism” replaced by “Secular Christianity” and mutatis mutandis so that Christians can get some idea of what a practical moral life should be. Too often “Secular Christianity” is regarded as Christianity lite. What nonsense! “Secular Christianity” is built on the shoulders of “Secular Christian” forbears who took Christian tradition in an entirely new direction, re-envisioning our sacred texts and practices in the light of scientific inquiry and the new frontiers of human thought. Today we embrace the best of tradition and modernity, science and spirituality. Ours is the Christianity of autonomy, inclusiveness, creativity, passion, relevance and depth. We are the Christianity for a new era, and it’s time we let the whole world know. “Secular Christianity” is unafraid to change our tradition when it holds us back from growing and deepening our faith. For us, change is not only permitted but obligatory. And sometimes it isn’t even fast enough. Ours is an inclusive Christianity. For too long the Christian community had no place for interfaith families and LGBTQ Christians. But we leant the sacred power of inclusion. The loving embrace of all who had been excluded adds to our numbers and to our strength. No questions are off limits in our texts. The core mission of the practical morality of Christianity has always been defined largely in social justice terms—to solve, on the basis of justice and righteousness, the problems presented by the evils of the organization of society. That sacred mission still inspires commitment among “Secular Christians” of all ages. “Secular Christianity”, when practiced with commitment, is no less demanding than other expressions of Christianity—and some would argue even more demanding because we do not practice by rote but by informed choice. What Jews do together is meant to shape a world of holiness, dignity, and equality for God’s children everywhere. That is the objective of “Secular Christianity” too. All people, all human beings, according to the Christian God, are not merely His children, but they are God! A Christian who wants to abuse another human being wants to harm God Himself, and God Himself repeated it once in a positive and once in a negative light ( Matthew 25:40;45) in the very context of eternal punishment and salvation ( Matthew 25:31-46). Any “Christian” concerned about their place in the future life they hope for ought to know this passage as the minimum Christian lesson. It is the duty of us all to help and not to harm others, and that is inescapable if anyone wants to claim to be Christian. Caring and sharing might not appeal to most Americans, especially the right wing ones who most frequently claim to be Christians, but that only proves what an intrinsically evil country the US is. It claims to be Christian because so many utterly unchristian Americans self designate themselves as being Christian. Yet almost everything that they think, say and do shows they are children of evil. As you would that people should do to you, do likewise to them. You shall love your neighbor as yourself. I am Yehouah. Whatever is hateful to you, do not do to another. What is sure is that Jesus linked failure to act in this kindly way to other people with eternal damnation. So do not regard anyone who is deliberately cruel or unkind to others as being a Christian. They are kidding themselves, and probably because they aim to kid you. You have to be kind to be Christian. That is what loving others means! Now print this off and keep it in your Tephillin or your wallet to read and remind yourself! Not least if you fear for your soul. In the discussion in The Washington Post following the items about whether Christianity is intrinsically socialist or capitalist in morality, mentioned below, the modern US capitalist oriented Christians so-called were flummoxed by the directness of their incarnated God’s message, and mostly turned to the Jewish scriptures or to Paul the Apostle for answers. They never seem to see any incongruity in citing pre-Christian Judaism against the direct words of God recorded as they fell from His own lips in the gospels, or the later teachings of a plain man trying his utmost to teach something quite different, while pretending to be preaching the same message as Christ, and succeeding so well that modern Christianity is Paulianity not Christianity! Some of Jesus’s examples brook no opposition they are so lucid. That anyone should be bold enough to question anything so unequivocal, uttered from the lips of the man they are supposed to consider God, proves that they are not Christians. They are happy to contradict the clearest statements of the divine man! How can this one, for example, be contradicted by America’s megarich “Christians”? Someone came and said unto him, Good Master, what good thing shall I do, that I may have eternal life? And he said unto him, Why callest thou me good? there is none good but one, that is, God. But if thou wilt enter into life, keep the commandments. He saith unto him, Which? Jesus said, Thou shalt do no murder, Thou shalt not commit adultery, Thou shalt not steal, Thou shalt not bear false witness, Honour thy father and thy mother, and, Thou shalt love thy neighbor as thyself. The young man saith unto him, All these things have I kept from my youth up. What lack I yet? Jesus said unto him, If thou wilt be perfect, go and sell that thou hast, and give to the poor, and thou shalt have treasure in heaven, and come and follow me. But when the young man heard that saying, he went away sorrowful, for he had great possessions. Then said Jesus unto his disciples, Verily I say unto you, That a rich man shall hardly enter into the kingdom of heaven. And again I say unto you, It is easier for a camel to go through the eye of a needle, than for a rich man to enter into the kingdom of God. The reward offered to those who are do these things is salvation, but the man prefers his gold. Jesus explains how hard it is to get into heaven when you are rich—he says it is impossible because a camel cannot go through the eye of a needle. One commentator confidently proclaimed that this is not the whole story for Peter and the other disciples wonder how anyone can be saved if the rich cannot be. The gospels always show the apostles as being utterly devoid of brain cells, they are so lacking in comprehension. It is a deliberate device of the bishops who commissioned the gospels, because, if they were really so thick, then Jesus must have been thick to select them. Here they are depicted as thick to allow the bishops to be able to insert an ameliorating clause. It is that “all things are possible for God”. So the rich can be saved if God chooses to let them be. It is enough to satisfy the rich, who convince themselves that an occasional act of charity will suffice to get God on their side. They have, of course, got the let-out clause upside down or inside out. The fact is that in Christian theology God is omnipotent and omniscient, and a few other things. Omnipotent means “almighty” or “all powerful”. It means He always has the final say. God is the Judge. He cannot be obliged to do anything under any conditions. That means that God’s promise is never certain! If God promises that all righteous people will be saved, it means that some of them will not be. That is why pastors are fond of saying that salvation is a gift. They use it as their excuse to deny that good deeds matter, despite the teachings of Christ that they do. It is certain that unrepentant sinners cannot be saved, because they will never be considered by the Judge. To be considered for salvation at all, people have to be perfect, that is righteous, free of sin, and, if they have sinned in their lives, they have to have repented, turned their lives around and not sinned again. The weight of the teaching of Jesus is that, having met the criteria he laid out, they will be eligible for a pass at Judgement, but it always remains God’s gift which He can always withhold, but probably will not. The same holds in reverse. God is the Judge of sin, and although rich men face an almost complete ban from consideration for salvation, God might offer one or other of them an improbable gift of eternal life, and only God knows why He will do it, if He has a reason at all. But the underlying Christian belief, as it was with the Essenes, is that God is not capricious, so that what we can only call a gift, God has His reasons for it. It is not a good bet to gamble that God will be benign to the rich man at Judgement Day when during His incarnation on earth, He said unmistakably clearly that for all practical purposes it was impossible for a rich man to get into God’s kingdom. So, gift or no gift, it remains true that “it is easier for a camel to go through the eye of a needle, than for a rich man to enter into the kingdom of God”. There was a certain rich man, which was clothed in purple and fine linen, and fared sumptuously every day. And there was a certain beggar named Lazarus, which was laid at his gate, full of sores, and desiring to be fed with the crumbs which fell from the rich man’s table. Moreover the dogs came and licked his sores. And it came to pass, that the beggar died, and was carried by the angels into Abraham’s bosom. The rich man also died, and was buried. And in hell he lift up his eyes, being in torments, and seeth Abraham afar off, and Lazarus in his bosom. And he cried and said, Father Abraham, have mercy on me, and send Lazarus, that he may dip the tip of his finger in water, and cool my tongue, for I am tormented in this flame. But Abraham said, Son, remember that thou in thy lifetime receivedst thy good things, and likewise Lazarus evil things, but now he is comforted, and thou art tormented. And beside all this, between us and you there is a great gulf fixed, so that they which would pass from hence to you cannot. Neither can they pass to us, that would come from thence. Then he said, I pray thee therefore, father, that thou wouldst send him to my father’s house, for I have five brethren, that he may testify unto them, lest they also come into this place of torment. Abraham saith unto him, They have Moses and the prophets, let them hear them. And he said, Nay, father Abraham, but if one went unto them from the dead, they will repent. And he said unto him, If they hear not Moses and the prophets, neither will they be persuaded, though one rose from the dead. It is hard to see how this parable can be read in any way other than the obvious and direct one that being rich can mortally damage your hope for an afterlife, if that is still any attraction to rich Christians. In the story related above, meant to be an actual incident in Jesus’s life, not a parable, the rich man is less attracted to the notion of being saved than he is to his bags of gold. So Jesus knew what the rich were like, and he even ends the parable of Dives and Lazarus by saying that even someone rising from the dead will not persuade them that riches are the “wages of sin”! That turned out to be a true prophesy, and all of these US Christian apologists for the rich man’s economic scam prove it!